Enter the name you'd like on the front cover exactly how you want it printed. Check spelling before submitting & do not use all capital letters! Space is limited on most covers, keep it as short as possible. Longer names will be printed as space allows. ALL BOOKS ARE FOR 2019. 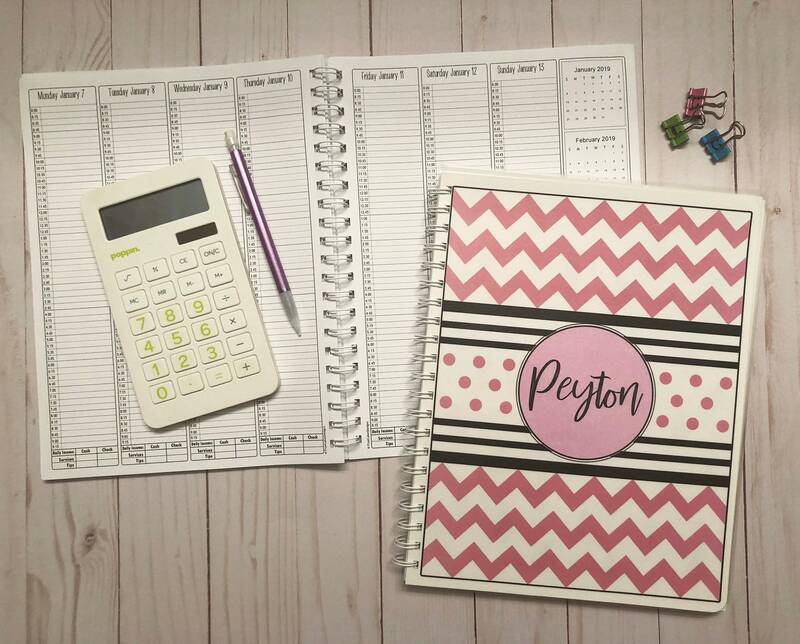 This yearly appointment book with optional Income Tracking and Expenses Tracking is perfect for your business. - Choose from 6 versions. Read thoroughly to decide which book is best for you. Check out the pictures for a better idea of what each book and pages include. - Jaimi Version - Not Predated. 7 day per week layout which starts on MONDAY. Daily time frame is 8am-9pm. Brystal and Dawn versions include Income Tracking for Cash, Check and Credit Cards. Federal holidays added throughout the year. Includes 2 binder clips to section off pages. *Back Cover can be laminated for $2 extra. It will be a plain white cover laminated in plastic. If you would like this option you have to use the Add-On Option available in my Etsy store and add that to your cart separately. 7 day per week layout starts on MONDAY. Days of week only at top of columns. Cari and Sara versions include Income Tracking for Cash, Check and Credit Cards. *Back Cover can be laminated for $2 extra. It will be a plain white cover laminated in plastic. If you would like this option you have to use the Add-On Option available in my Etsy store and add it to your cart separately. - You will need to let me know which font you'd like in the Notes to Seller section. See pics for choices. If you don’t choose a font I will choose one for you that looks best with your name. - Since all items are made to order and most have personalization I do not offer refunds or accept returns. - Overall Size: 8.5" x 11"
- Materials Used: Laminated cardstock front cover. Heavy weight quality paper (you can erase writing in pencil and it won’t be affected). Chipboard back cover. This ships to you fully assembled and ready for use! Not available for instant download. This book and its contents are Copyright Protected. This book looks so amazing I wish I could give 6 stars! It arrived very quickly in great condition. Very much looking forward to ordering here again! 2019 PreDated or Undated Nail Technician Yearly Appointment Book with Optional Income and Expenses Tracking. 6 Versions to Choose From.